user warning: Expression #1 of ORDER BY clause is not in SELECT list, references column 'hotkilns_live.n.created' which is not in SELECT list; this is incompatible with DISTINCT query: SELECT DISTINCT n.nid, n.vid, n.title FROM content_field_series_accessories nr INNER JOIN node n ON n.vid = nr.vid AND n.status = 1 INNER JOIN node_access na ON na.nid = n.nid WHERE (na.grant_view >= 1 AND ((na.gid = 0 AND na.realm = 'all') OR (na.gid = 0 AND na.realm = 'content_access_author') OR (na.gid = 1 AND na.realm = 'content_access_rid'))) AND ( nr.field_series_accessories_nid = 240 )ORDER BY n.created DESC in /home/hotkilns/public_html/sites/all/modules/nodereferrer/nodereferrer.module on line 428. 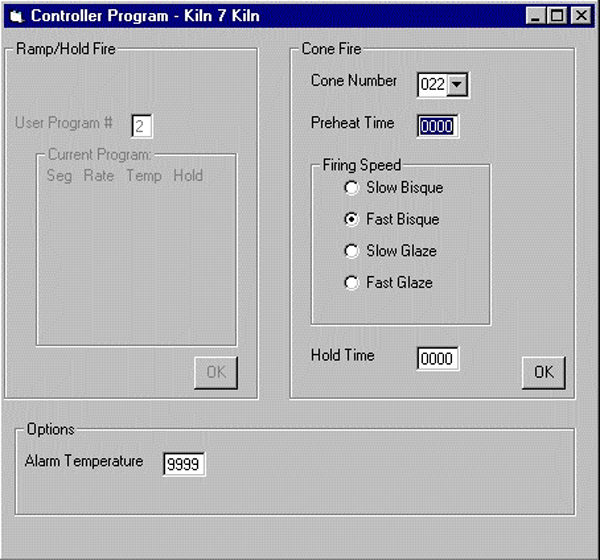 Kiss (kiln interface software system) connects up to 50 DynaTrol controllers to a personal computer running Windows 95, Windows 98, Windows 2000, Windows XP, Vista, Windows 7, and Windows 10 (just not Windows NT). Kiss is an easy-to-use interface for programming and monitoring of the controller from a computer up to 4000 feet away. You can see the state of all ten kilns at a glance or view the in depth status of any individual kiln. 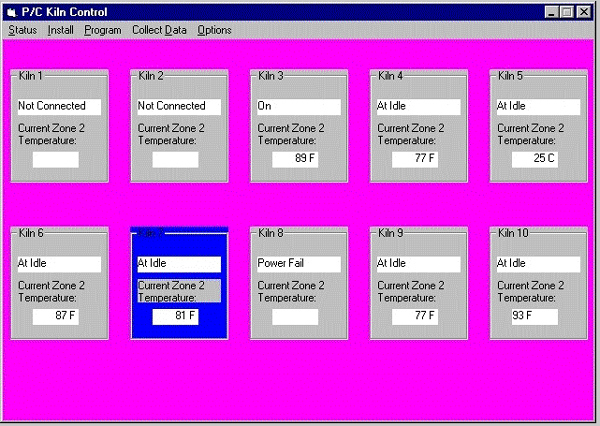 The “collect data option” turns your computer into data acquisition system to store the set-points and the kiln temperatures in a file for graphing. It puts the data into a spreadsheet form. The summary report will keep a history file of the date, program fired, firing time and final temperature for each firing of each kiln to help with maintenance records. 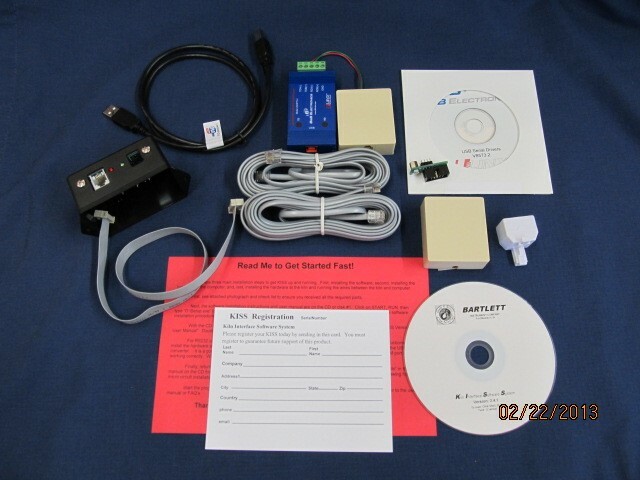 The starter kit includes KISS Windows-based software on CD, a 25 foot modular cable (to connect from the computer to the kiln), a modular connector to install on the kiln, an RS485 chip to install in the controller and either an opto-isolated RS232 to RS485 converter or a USB to RS485 converter. RS485 communications chip (MAX487 integrated circuit) to put onto the DynaTrol controller. Using a program such as PCAnywhere, GoToMyPC, or LogMeIn you can control and monitor the control computer remotely. Some of these programs are totally free or very inexpensive. You can control your computer remotely as well as see what it is doing. 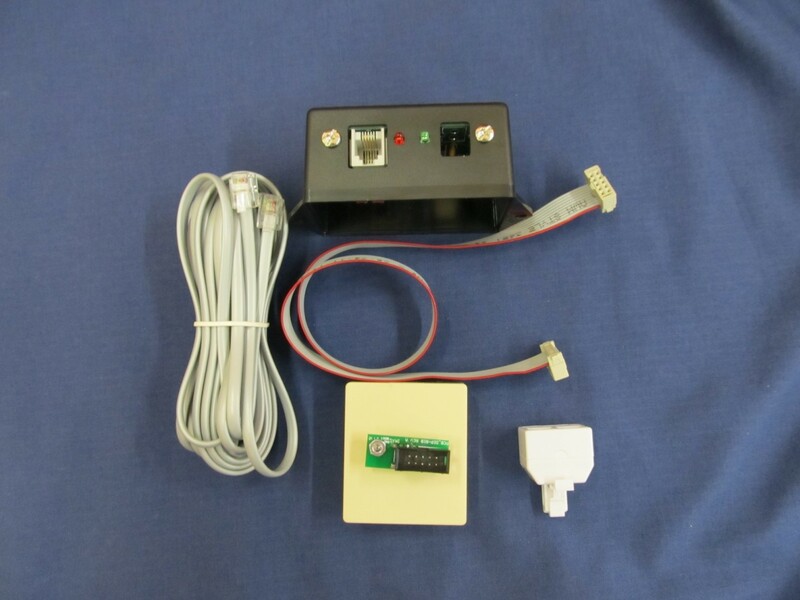 If you can remotely control your computer that is connected to the kiln network, then you will be able to access all the functions available from the software. That includes the capability to start the kilns, stop them, change the programs, collect data, etc. It is extremely important if you access those functions remotely, especially such as starting the kiln, that the user is fully confident that the kiln is securely closed and there are no objects near it that could be harmed by the extreme heat. Here’s a link to the main status screen for each kiln connected. You can see options there for starting the kiln now, stopping the kiln or programming a delay start for the kiln. There is a one-time cost (shown below) for the first kiln and then a small charge for each additional kiln that you connect. This is for all the hardware and software necessary to do the job. Can we download the program before we get the hardware? Sorry, but there is not currently have a way to download the program. The good news is that the software part of the system is usually the easy part to get up and running. The hardware connections seem to generate more customer service calls to Bartlett than the software part. Is there a maximum length the kiln can be from the PC? The first kiln in the chain of kilns can be up to 1000 feet from the computer. How can I determine which of the kilns we have can be hooked up the the KISS system. The controller has to be a “Series 600” or "Series 700" Bartlett (DynaTrol) controller. Here’s a link to a page on the Bartlett web site that shows the difference in displays between a 600 board and the, more current, 700 board. There are serial numbers on the circuit board inside the controller itself and those would also tell whether the controller can communicate with the KISS system. The 600 series requires a KISS 2 extension kit, but, with 700 series controllers, there are some different hardware configurations that determine a bit of difference in which extension kit is required. See this link for more information on the network. See this link for information about when L&L used 600 Series boards. Is there a way to print the manual. The manual is only available as an online document. There is one included on the CD on which KISS is distributed, but it is still an html document. What kind of Wire Can I use? Use the cable supplied with the KISS system. Using the wrong wire is a common cause of problems. The ESSENTIAL part is that the cable must be straight-thru wire and most cable on the market is twisted-pair wire. The cable looks like an ordinary phone cable, but phone cable is generally twisted-pair. If you choose to do otherwise, the specifications for the cable supplied is that it is a 25' modular cord, 6-position, 4 contacts, straight-thru wiring, RJ11-6P4C.